Welcome to the Redditch Westerners Association. Redditch Westerners Association, Country and Western Club welcome you to our website. These pages have been created to inform our members and individuals interested or involved in the country and western scene of our club nights, special events and information that will assist the country and western enthusiast. 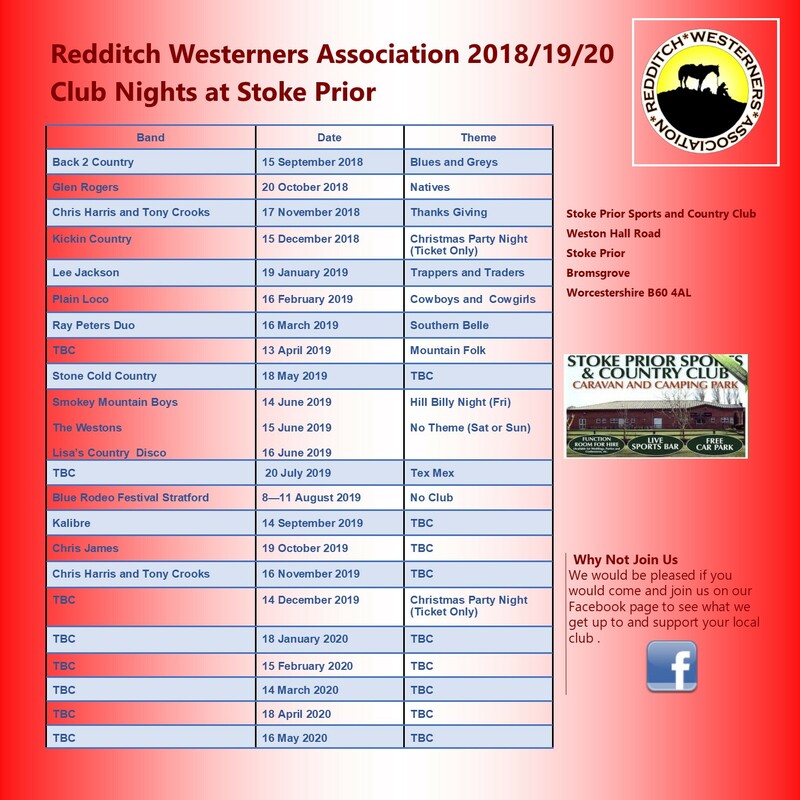 Throughout our calendar year we hold monthly club nights at Stoke Prior, Bromsgrove as well as a number of special events including the Summer Round Up (June each year) held at Stoke Prior and the Annual Blue Rodeo Festival (each August) hosted at Stratford upon Avon Racecourse. Our Photo Gallery pages show what our members get up to. You can look back on the pictures taken at our events, remembering all those good times we have had. Our Gig Guide shows the great artistes we have coming to our club nights and future events. The Redditch Westerners book great artistes both established and up and coming in the world of Country Music. Why not come and try one of our club nights down at Stoke Prior. Blue Rodeo Weekend festival camping from £40 per person. Club Nights at Stoke Prior, Weston Hall Road, Bromsgrove.